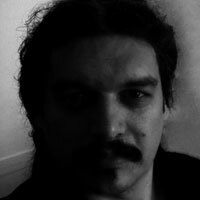 Yannis Livadas is a contemporary Greek poet, born in 1969. He refused to join the army, to complete the formal schooling and to study at some university as a result of his belief in individualist anarchism. Livadas’ unique aesthetic position, both in his poems and his essays, constitutes the idea of experimentalism based on antimetathesis -the scaling indeterminacy of meaning, of syntactic comparisons and structural contradistinction. He believes that poetry is creation/synthesis and stands beyond the limits of expressional writing; that poetry is the action of ultimate difference within the same thing. He is also an editor; essayist, translator, of more than 50 books of American poetry and prose; and independent scholar with specialization on haiku, literary modernism and postmodernism. He is also a columnist and freelancer contributor to various literary magazines, both in Greece and other countries. His poems and essays have been translated into six languages [English, French, Indian (Bangla), Croatian, Spanish and Serbian]. He lives in Paris, France.